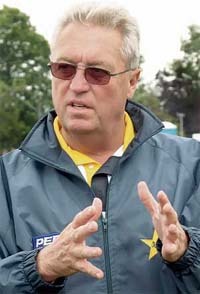 KINGSTON, Jamaica: Pakistan cricket coach Bob Woolmer died in hospital on Sunday soon after he was found unconscious in his hotel room. The 58-year-old former South Africa coach, who played for England between 1975-81, was found unconscious at the Pegasus Hotel at 1045 local time. Pakistan lost in an upset to Ireland at the Cricket World Cup on Saturday, ending its chances of advancing in the tournament and almost ensuring the end of Woolmer's tenure as coach. Pakistan Cricket Board chairman Naseem Ashraf said Woolmer had complained of breathing difficulties before the team left for the World Cup, and was diabetic. "He informed me of this just before the team departed for the West Indies and I told him 'take care of yourself Bob'," Ashraf said in a Pakistani TV broadcast, adding that Woolmer sometimes wore an oxygen mask to sleep. He was taken to the emergency ward of the nearby University hospital but did not regain consciousness. Pakistan were eliminated from the World Cup on Saturday after losing by three wickets to minnows Ireland. Woolmer told BBC Radio Five Live after the Ireland match that he was considering his future in the game. "My contract runs out on 30 June anyway but I want to sleep on it before I make a decision about my future," he said on Saturday evening. "I have said I am reluctant to continue in international cricket purely because of all the travelling but I will stay in cricket at a different level. "But I think the decision has been made for me really. 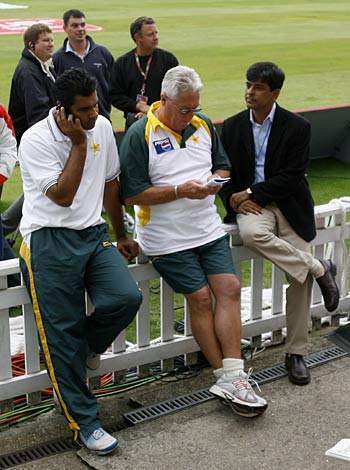 I will talk to the PCB and if they want me to stay until 30 June I will stay, if they want me to go I will go. "I am not going to break my contract but if the PCB want to get rid of me that is their business." Pakistan's preparations for the World Cup have been far from ideal, which Woolmer also alluded to. 12:14 p.m. local time after being taken to hospital by ambulance. "Mr. Woolmer was found in his hotel room by cleaning staff shortly before noon in an unconscious state," the High Command of the Jamaica Constabulary Force said in a statement. "He was attended to by medical personnel at the hotel who also accompanied him to the hospital. "A team of police and medical personnel is conducting preliminary investigations at both the hotel and hospital. A post mortem will be done at the earliest possible time." Woolmer was survived by his wife, Gill, and two sons. Pakistan team spokesman Pervez Jamil Mir said the Pakistan Cricket Board was waiting for Woolmer's relatives to arrive before making any arrangements. "The Pakistan team and management are shocked and saddened by his passing," Mir said. "We extend our deepest condolences to his family." West Indies captain Brian Lara, who was playing for Woolmer at English county Warwickshire when he scored his world record 501 not out in 1994, said he had a wonderful relationship with the Englishman. "Our relationship continued to grow over the years even though we sat in different dressing rooms," Lara said. "He was a very focused man with a great love for the game but what shone through was the great love he had for players under his charge, everyone meant something to him." International Cricket Council chief executive Malcolm Speed said Woolmer would be missed by "thousands and thousands of friends within cricket." "He was a great cricket man. His life was devoted to cricket," Speed said. "He played, coached and commentated on the game all of his life." Speed said the ICC was working in conjunction with the Pakistan Cricket Board and the Pakistan government on a tribute to Woolmer. "It is difficult to think of a man who was more committed to the betterment of the sport than him," ICC president Percy Sonn said. "From an ICC perspective, we owe Bob a huge debt of thanks as he played a pivotal role in the development of cricket." Woolmer, who played 19 test matches for England, worked as a coach on three continents, including a stint for the ICC overseeing developing cricket nations. "Bob was very well regarded as a coach," Speed said. "He was very passionate about the game. Many of us had many heated discussions with Bob because he had strong views about the way the game should be developed and he played a very important role with us in those years." Clive Lloyd, who led the West Indies to the first World Cup title in 1975 and is manager of the current team, said Woolmer "was a great guy and a really great coach." "It's sad that such a tragedy should take place in the World Cup — I feel sad for his family." England and Wales Cricket Board chief executive David Collier said Woolmer would be remembered fondly as a player for his 149 against Australia in 1975. "The passing of Bob Woolmer in Jamaica today casts a sad shadow over the 2007 Cricket World Cup," he said. "Bob was one of the world's greatest coaches and as a player his innings of 149 lasting more than 8 hours against (Dennis) Lillee and (Jeff) Thomson demonstrated not only how talented a player Bob was but also his pride in wearing the England sweater." But his impact as a coach was more immense, Collier said. "Bob will be best remembered as one of the world's leading coaches," he said. "He embraced innovation and was at the forefront of many new developments in the game."